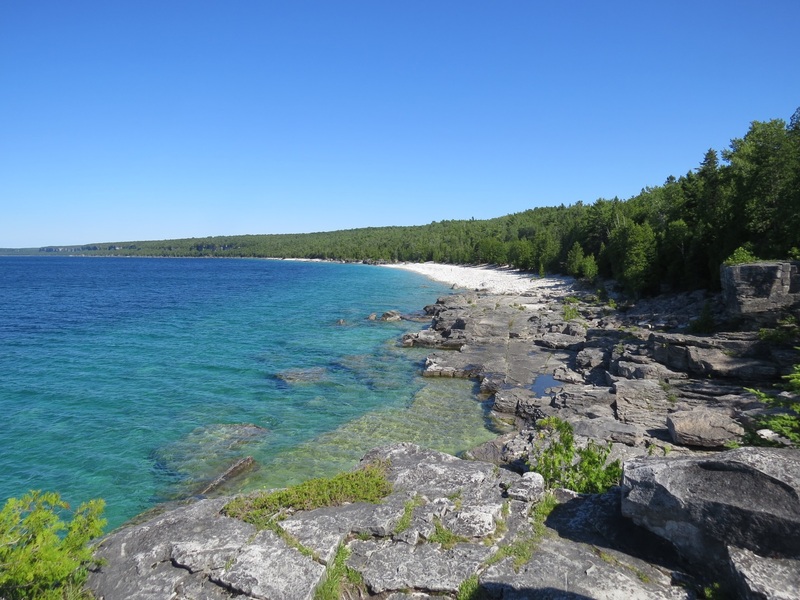 This past week the team of travelling aquatic arthropod samplers visited Bruce Peninsula National Park, or BPNP. Connor, Adrian, Shannon, and I assembled from the roster of BIO Collection employees to make up last week’s BIObus team – you can see us posing for a great photo on the shoreline of Little Cove with beautiful Georgian Bay in the background. 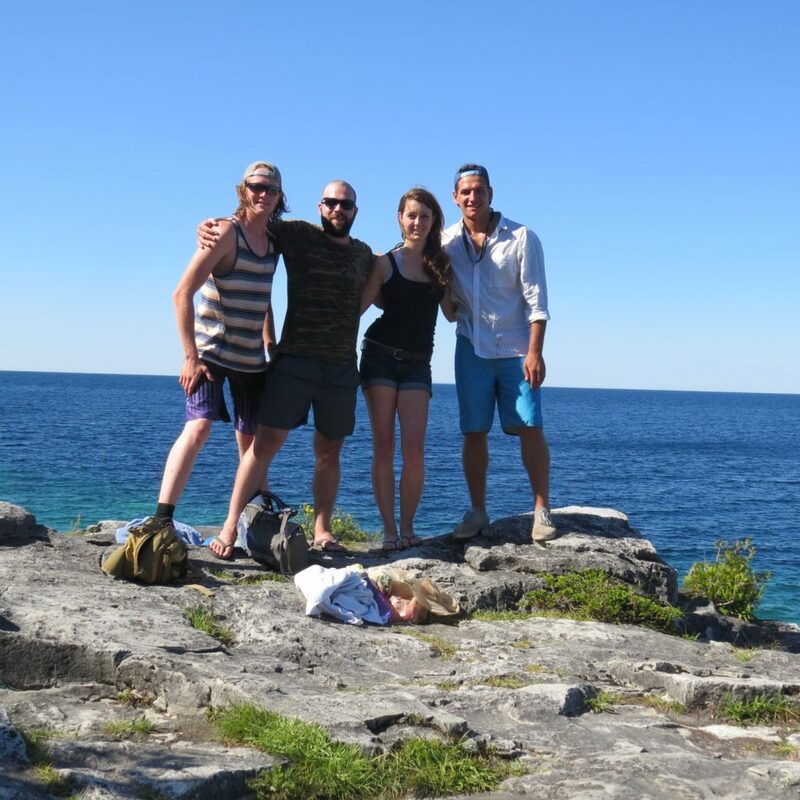 Our sampling team posing for a picture along the shoreline of Little Cove in Bruce Peninsula National Park. Left to right: Nate, Connor, Shannon, Adrian. We had a great week sampling a variety of aquatic habitats including the Crane River and a nice Bog that was attached to the back of one of our campsites. This bog was my favourite sampling site; it contained an abundance of wildlife and many aquatic insects, especially damselflies and giant water bugs (Belostomatidae). We also saw a few beavers that made this bog home. 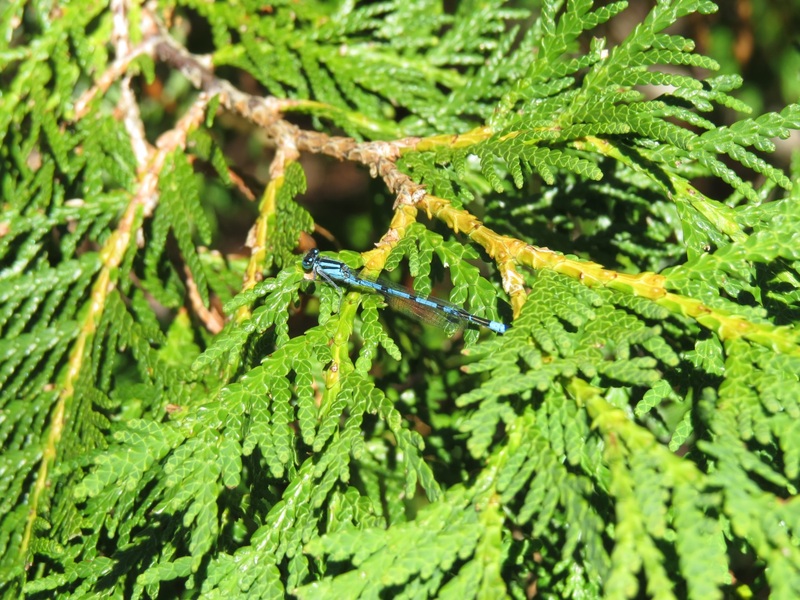 An adult damselfly found on vegetation around one of the bogs we sampled at Bruce Peninsula National Park. A defining characteristic of BPNP is its geology; it is part of the Niagara Escarpment that begins in Niagara Falls and ends in Tobermory. The escarpment forms the majority of the peninsula and is responsible for its unique geological features. The rock is mostly dolomite which was created as the tropical sea that covered over this area around 400 million years ago began to dry up. As this ancient ocean evaporated, minerals began to be concentrated and the magnesium from the water was absorbed into the limestone which created the harder dolomite rock. Due to differences in the hardness of some rock layers, some very interesting erosion patterns were created giving some of the shorelines amazing cliffs and strange rock pillars. We were at Little Cove exploring the shoreline and gazing at the large cliffs located in the background of the pictures. 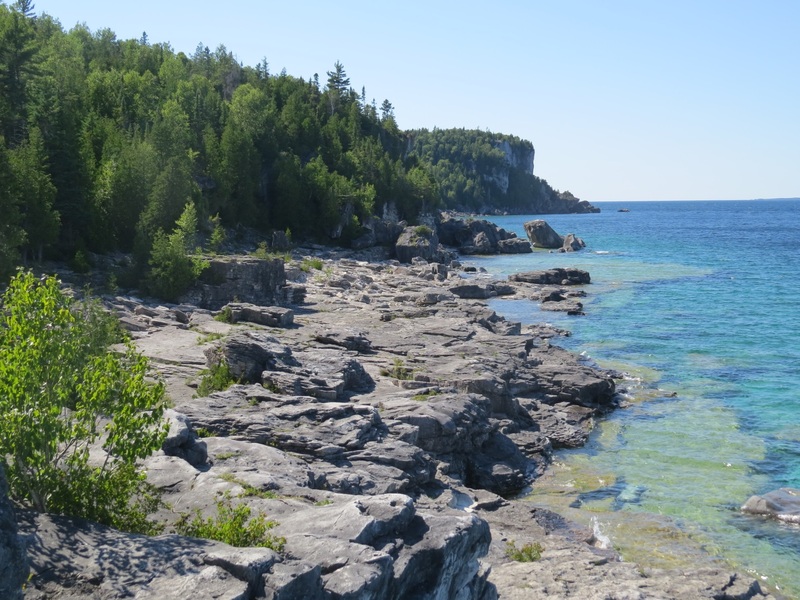 The beautiful shoreline of Little Cove – you can see the rocky beach and a good representation of the rock type that makes up the escarpment. Another photo of the shoreline along Little Cove. The dolomite rock dominates the shoreline and the large cliffs are visible in the background. The last few photos I choose to include show some of the work that we have to do in order to sort and preserve the aquatic samples. The team works together to strain water from the samples and sort through them to look for any arthropods that may be hiding in some mud, algae, or other aquatic substrate that was collected in our dip nets. Once we have picked the large arthropods from our sample we pour excess water into jars and allow the sample to sit and separate over time. This allows for sediment and sedentary or benthic arthropods to sink to the bottom of the jar. 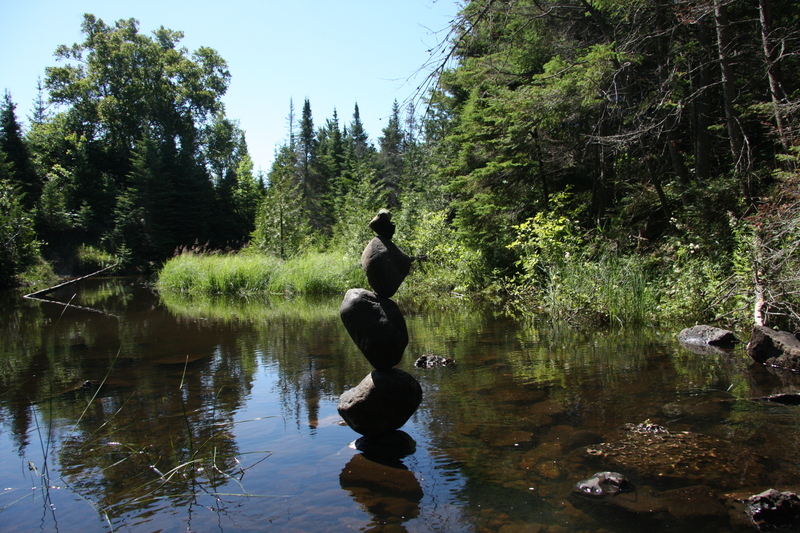 Remaining above the heavier substrates is clear water and any mobile/free swimming arthropods. This sample of free swimming arthropods is what we call “micro A”. In this specific sample, there was an amazing abundance of aquatic mites. 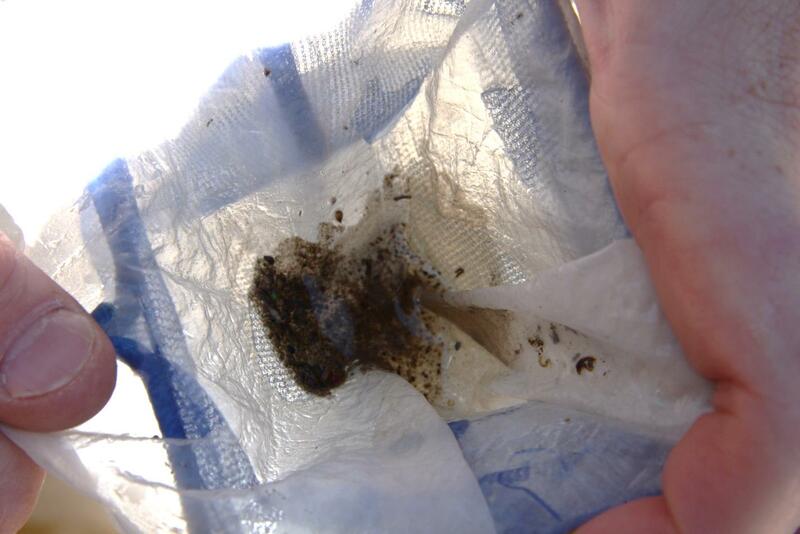 Most of what you see in the mesh looks like some type of dirt or mud but is actually mostly water mites. Once I drained the water, the bottom of the net was alive with these wiggling mites, it was very interesting! Connor, Shannon, and I sorting and separating arthropods from aquatic substrate. This is a photo of a “micro A” sample. The majority of organisms here are aquatic mites, but the abundance of mites makes them hard to distinguish from one another. 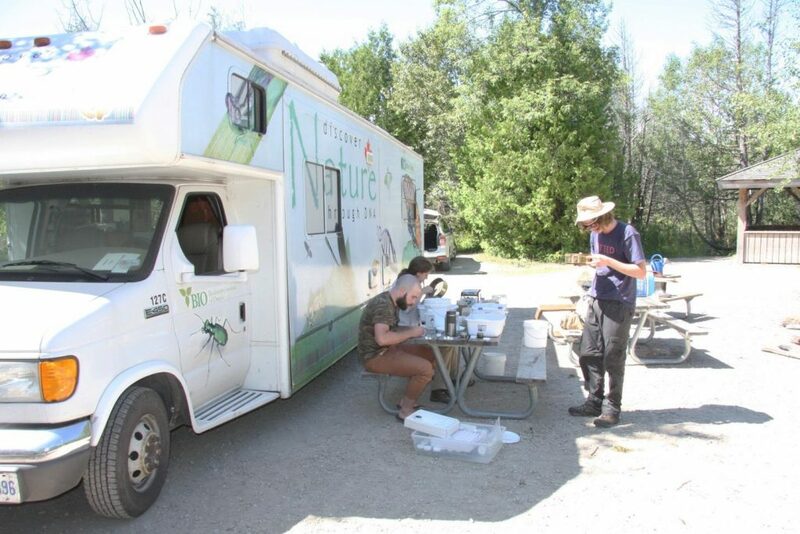 Last week I returned to the BIObus for more aquatic sampling. 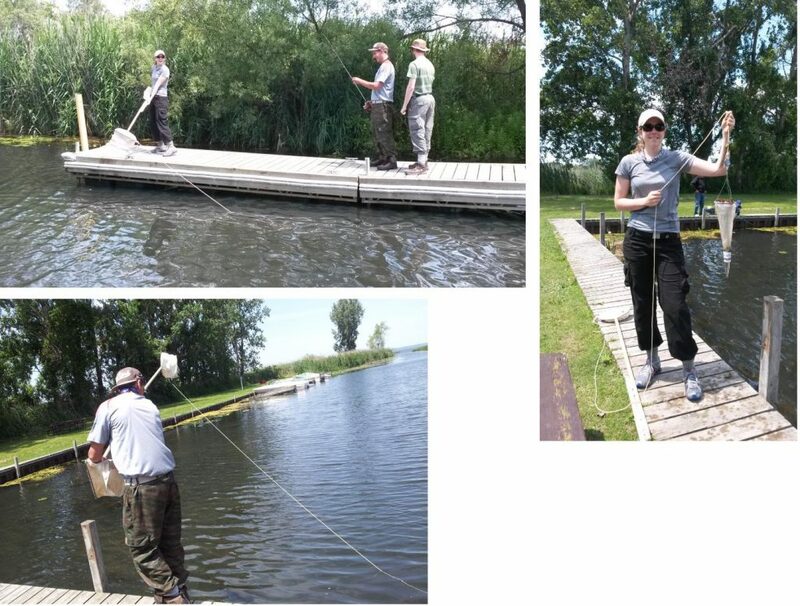 This time we visited sites within the Backus Heritage Conservation Area, Long Point Provincial Park, and the Nature Conservancy of Canada (N.C.C.). 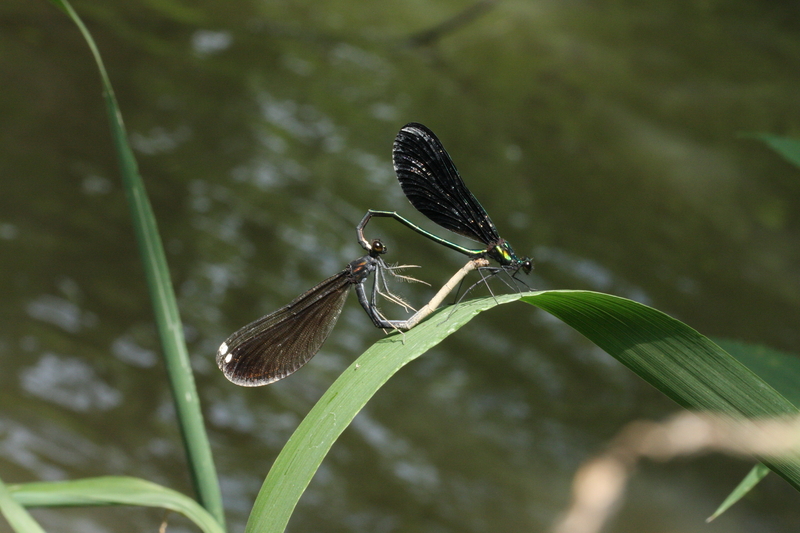 Today I’ll be talking about the river damselflies that were almost ubiquitous across our sampling areas and some details about our time in Long Point and the N.C.C. 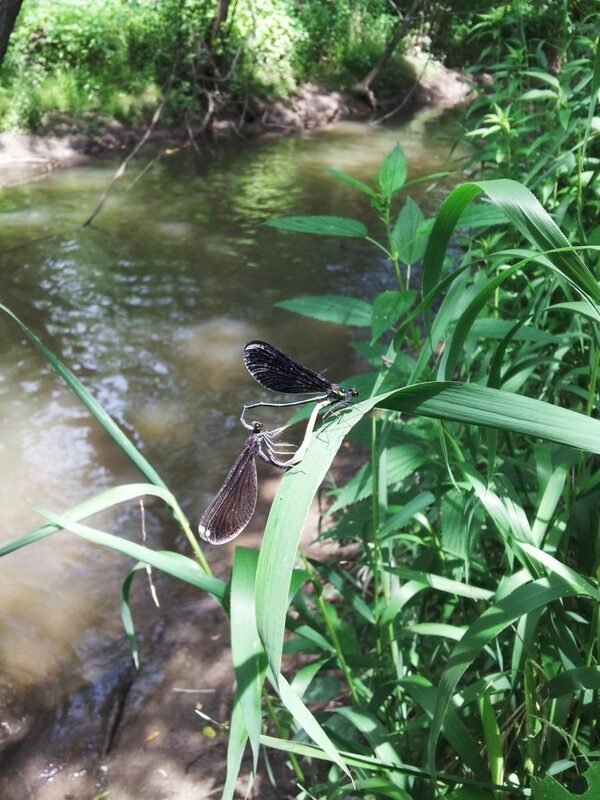 Most of the areas we sampled during our trip were rivers or streams which are home to the larvae of damselflies, the suborder Zygoptera, and dragonflies, the suborder Anisoptera. Together, these two groups comprise the order Odonata. Distinguishing the two suborders is pretty easy with a little practice; dragonflies have larger more robust bodies and usually rest with their wings spread wide, while damselflies have thinner more fragile bodies and rest with their wings together above the body. Additionally, dragonflies ted to catch prey on the wing like fighter jets with legs, while damselflies usually scoop up their quarry from leaves. The glittering jewelwings in the family Calopterygidae (which means beautiful wings) were by far the most populous odonate we saw on the trip, with so many at one site that you couldn’t help but have ten in your field of vision at a time. There we got to see a wonderful display of their mating and male-male competition. The males compete for the most desirable locations to display to females. I saw many sizing each other up in the air, and even a couple pugilists dragging their opponents right off of the sought after leaves. After a female has chosen the male who has the prettiest display location and aerial dance, she allows him to “mount” her and things start to drift from what we expect. The male will clasp the tip of his long abdomen onto the back of the female’s head, after which she obligingly connects her abdominal tip to the bottom of his body. Now you might ask “but how are little damselflies made from that?” Well, in preparation for this event, the males will place their sperm onto a special secondary structure located under the thorax. It’s this secondary structure that the female connects with to fertilize her eggs. Afterwards, the male will follow her around or stay attached until she lays her eggs and he can assure his paternity. Nature is weird, but fascinating. Our trip to Long Point was interesting as well. Usually we use a boat to collect plankton samples once per week out in a large body of water. This week, however, we didn’t have access to the boat and had to collect from the dock of the boat launch using a jury-rigged collector made of two D-nets taped together. Despite the absurd appearance of our sampling method, we managed to trawl quite a lot of plankton out from the water. In contrast to the readily available water at Long Point, our sites at the N.C.C. were more difficult to find. We searched grid like through the conservation blocks, which appear to be properties reclaimed for nature, and eventually came across a nice stream and small wetland area to collect in. We collected a lot of small crustaceans in that area, which might relate to the proximity of these sites to farm land and the high sulphur content in the soil. There’s always something to learn from the bugs you find if you keep your eyes and mind open. That’s all for this week’s blog, see you in a few weeks!